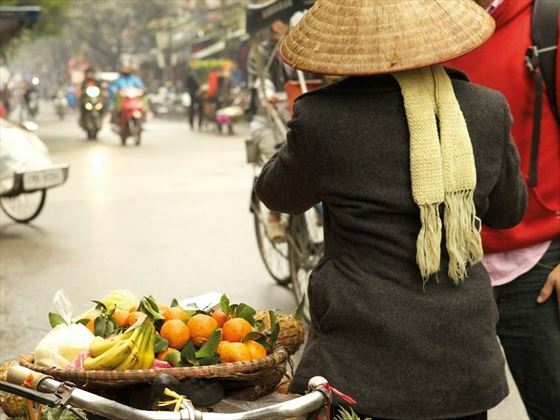 Travel the length of Vietnam, one of Asia’s most fascinating and diverse countries, on this 14-night small escorted tour. You’ll discover bays dotted with limestone karsts and motorbike-choked cities, rice paddies and beaches, as well as ancient temples and the tombs of royal emperors. 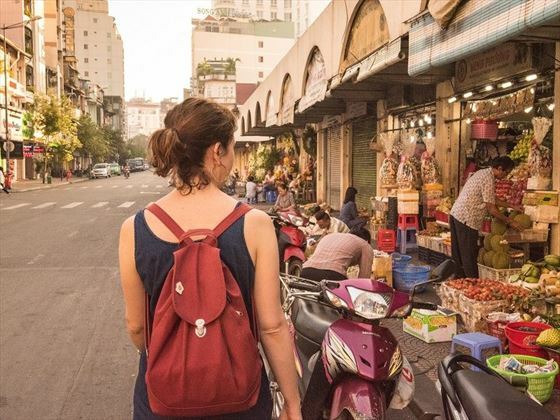 Your adventure begins in Ho Chi Minh City in the south and ends in the northern capital Hanoi, stopping at Vietnam’s top destinations along the way. Sail the emerald waters of UNESCO-listed Halong Bay, spend a night with locals in the Mekong Delta, explore the charming port city Hoi An and relax on white sands in Nha Trang. You’ll get the chance to sample authentic Vietnamese dishes, travel on a traditional sleeper train and learn about the country’s stirring war history. 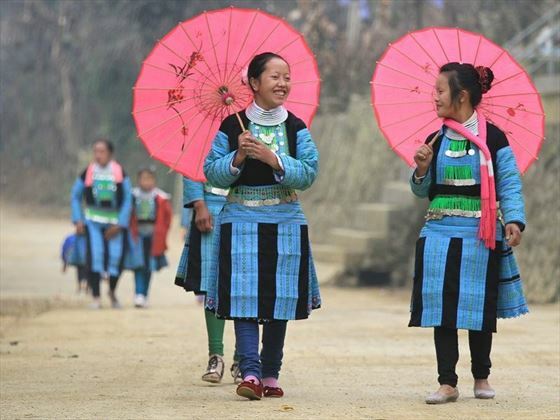 This tour offers the perfect blend of culture, adventure and history (INT - TVKT). Stay with locals on a Mekong Delta cultural exchange. Take an overnight cruise on Halong Bay, a UNESCO World Heritage Site. Enjoy relaxing beach time, boat trips and snorkelling in Nha Trang. 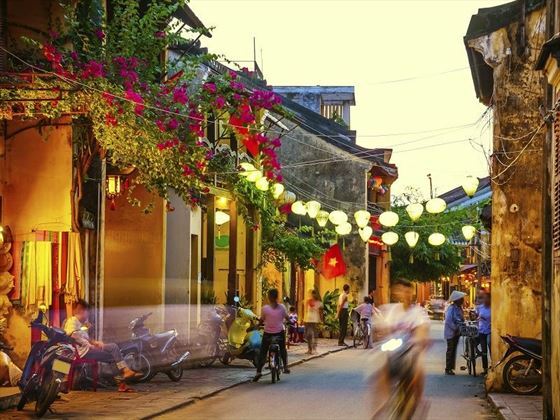 Visit the ancient port city Hoi An, which is famous for its markets and tailors. Explore Vietnam’s former capital, the royal city of Hue. Tour Hanoi’s scenic Old Quarter and visit Ho Chi Minh’s stilt house. Experience a traditional sleeper train journey. Welcome to Vietnam! Your adventure begins with a complimentary airport transfer to your hotel. If you arrive early, take a stroll to get an initial taste of this vibrant, chaotic city before the welcome meeting at 6pm and dinner. After a buffet breakfast at KOTO, a restaurant that trains local underprivileged youths in hospitality skills, you’ll make the three-hour drive through the Vietnamese countryside to Cai Be. This is the jumping-off point for exploring the Mekong Delta, also known as Vietnam’s Rice Bowl, by boat. 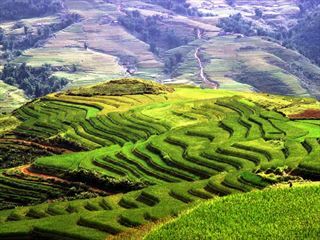 Enjoy the peaceful surroundings filled with rice paddies, villages and orchards where you can taste tropical fruit. In the late afternoon, you’ll be taken to a guesthouse where you’ll spend the night with Mekong residents and sample a typical local meal. Since you’re staying with local hosts, the accommodation will be simple, consisting of twin and double rooms complete with bedding and mosquito nets. Bathroom facilities may be shared and have no hot water. Start the day with a dawn trip to a traditional Mekong Delta market where you can shop and watch locals trade. Next, you’ll journey back to Ho Chi Minh city for a walking tour. As well as sampling a slice of local life in the busy streets, you’ll take a trip to the moving War Remnants Museum to learn about Vietnam’s fascinating, yet troubled, history. You’ll also have the chance to enjoy optional activities like visiting the Reunification Palace, which was famously overtaken by Ho Chi Minh’s communist army in 1975, a key turning point in the war. Today you’ll take a trip to the claustrophobic Cu Chi Tunnels, which were famously used by the Viet Cong soldiers in the war. During the tour, you’ll have a chance to look at the underground tunnels, which stretch over an impressive 120 kilometres, and learn about the tactics and booby traps employed by the Viet Cong against American soldiers. In the evening, you’ll board the overnight train and head south to the beach town of Nha Trang. Enjoy the adventure of travelling in a traditional sleeper carriage, a typical mode of transport for Vietnamese people. Many trains have dining carts, but it’s also a good idea to bring your own snacks. Berths typically accommodate four to six people with bedding provided, so be prepared that you may have to share your compartment with people outside of your group. Arrive in Nha Trang, one of Vietnam’s top beach destinations, which is often referred to as the Cannes of the Orient. Transfer to your hotel and spend the rest of the day as you please. Relax on the crescent-shaped sandy beach set against a backdrop of mountains and bathe in clear, turquoise waters. Explore Nha Trang’s bustling promenade, which is lined with bars and restaurants, or take optional trips to nearby sights. These include the Po Nagar Cham Towers and nearby hot springs where you can take a rejuvenating mud bath. Enjoy a boat trip to some of Nha Trang’s peaceful nearby islands. The trip includes visiting a traditional Vietnamese fishing village and a delicious seafood lunch buffet. You’ll stop on Hon Mun Island to explore and have plenty of free time to relax on board, go swimming or snorkel to catch a glimpse of the colourful underwater life. The day starts with a short flight to Danang, followed by an hour-long bus journey to the UNESCO World Heritage Site, Hoi An. Spend the rest of the day exploring this 15th century colonial port city independently. 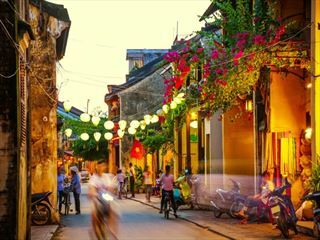 Stroll through the lantern and tree-lined streets, which are particularly tranquil due to a vehicle ban, and discover a mix of colourful French buildings, Vietnamese houses, Chinese merchant homes and a Japanese Bridge. If you feel like shopping, Hoi An is the perfect place to pick up some souveniers. The streets are full of shops selling traditional crafts and tailor-made clothes. Express services can even whip up a quality, made-to-measure silk outfit in 24-hours, or ship items straight to your home country. 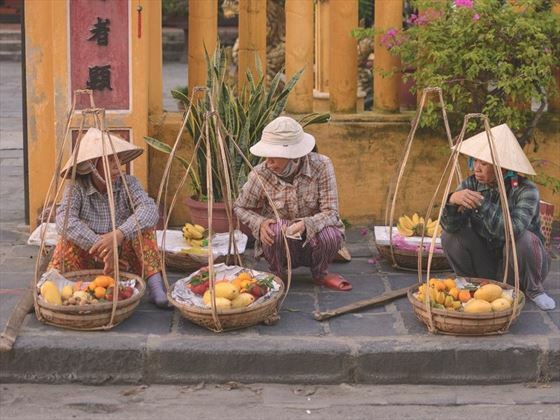 Learn more about Hoi An’s history as a major trading port on a walking tour around the Old Town, where your guide will point out key sights and architectural influences from Europe, Vietnam and China. In the afternoon, you have time to relax or continue exploring. Optional activities include heading to a nearby beach, or taking a combined bike and boat tour through the countryside and along the Thu Bon River. If you fancy tasting some of the local delicacies, join a street food by night excursion. You have a free day in Hoi An to fit in any activities you’ve missed or simply chill out. Head out early to the local street market where locals buy and sell fresh fish, produce and spices or take a Vietnamese cooking course and learn how to make classic dishes like Pho. If you prefer to do some more sightseeing, take a day trip to the World Heritage Site My Son, which is set in a beautiful valley surrounded by hills and the Cat’s Tooth Mountain. Discover temples and ruins of the Cham civilisation, which date back to the 4th century. Today you’ll move on to Hue, Vietnam’s former capital and home of the Nguyen Dynasty between 1802 and 1945. Along the way you’ll drive over the Hai Van Pass, one of the most scenic highways in Vietnam, set along the mountains overlooking the sea. You’ll make a stop at Lang Co, where you can take in the views over lunch. Arrive in Hue, a UNESCO World Heritage Site, which straddles the Perfume River and is filled with impressive historic treasures. Tour the 19th century Imperial City and Forbidden Purple City, where the ancient emperors once lived and ruled. This walled area is surrounded by a moat and filled with shrines, gardens and palaces. Breakfast on Bun Bo Hue, local beef noodle soup, before taking a cruise along the Perfume River. 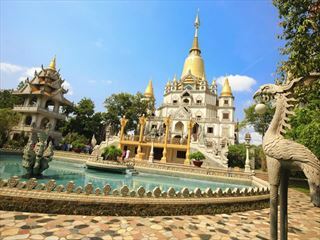 The trip includes a stop at the ornate, 21-metre high Thien Mu Pagoda, which is a Buddhist monastery that dates back to 1601. Among the displays you’ll see a car belonging to a monk who self-immolated to protest against the terrible treatment of Buddhists. Note that during festival season, you may have to travel over land rather than on the river. Hue is also home to some of the decorative tombs of the last Vietnamese emperors. You’ll visit the royal tomb of Emperor Tu Duc, which is one of the most beautiful, set in a garden with a lake and frangipani trees. You’ll have lunch at a Buddhist monastery or nunnery, which gives you a chance to support these local institutions and taste some traditional food. Today you’ll fly north to Vietnam’s vibrant capital city, Hanoi, which is home to over 1,000 years of history. An afternoon tour will give you an overview of the city. Wander the maze-like, 36 streets of the Old Quarter, which are filled with traditional Vietnamese shops, restaurants and hordes of beeping motorbikes. This contrasts with the peace of nearby Hoan Kiem Lake, where locals gather to exercise, stroll and relax. You’ll get to see architectural treasures such as the Chinese-style Temple of Literature and the One Pillar Pagoda. At the presidential complex, you’ll see a grand yellow palace and the traditional wooden stilt house where Vietnam’s revered revolutionary leader, Ho Chi Minh, lived. In the afternoon, you have free time to continue exploring Hanoi. Optional activities include visiting the Vietnam Fine Arts Museum, which promotes the cultural heritage of the country’s ethnic communities. Make the four-hour journey by private bus to Vietnam’s most popular attraction, Halong Bay. Enjoy an overnight cruise on the famous bay, which is listed as a UNESCO World Heritage Site and one of the New Seven Wonders of the World. 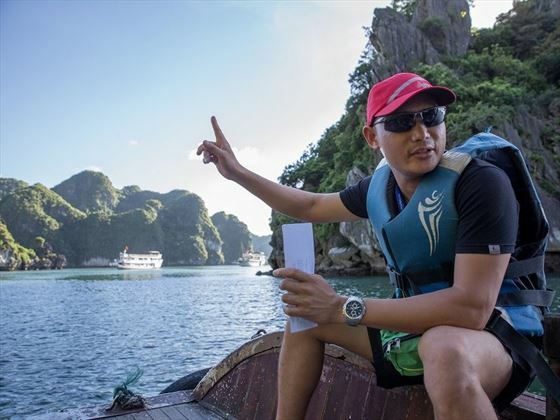 Sail the paper-flat emerald waters, which are dotted with over 2,000 unique limestone karsts and formations. Explore magical caves, take a swim in the summer months or go kayaking around the bay to see floating villages, which are home to locals who’ve inhabited the bay for generations. You’ll stay on a traditional junk boat, which has twin cabins with air conditioning and private bathrooms. There’s a dining room where you’ll have group meals, including a seafood lunch buffet. It’s a good idea to pack an overnight bag for the cruise and store your main luggage in Hanoi. Note that due to restrictions on how many boats can stay in Halong Bay overnight, you may be placed on a larger vessel shared with another group. In the morning, you’ll drive back to Hanoi, making a stop at the Dong Trieu Factory, where locals make ceramic art. Back in the city you’ll watch a unique water puppet show hosted by a local family who specialise in this ancient art form, which originated in the Red River Delta Region. There will also be time for optional activities such as shopping and visiting the Museum of Ethnology. You can visit one of Hanoi’s most popular museums, the Hoa Lo Prison, a Spanish colonial institution that was later used to incarcerate American soldiers and fighter pilots. Spend your final day in Hanoi however you like. Stroll around the city, shop or soak in the atmosphere at a street-side coffee shop. If you want to make the most of your last day, you can opt to take a bike tour of the city, or a street food by night tour. You can depart your accommodation at any time. Accommodation: 11 nights in a hotel, one night in a guesthouse, one overnight sleeper train and one overnight boat. Transport: boat, bus, taxi, train, domestic flights, private car. Food: 14 breakfasts, five lunches and four dinners. Activities: War Remnants Museum in Ho Chi Minh City. Local market tour in the Mekong Delta, trip to the Cu Chi Tunnels and boat trip and Hon Mun Island swimming and snorkelling in Nha Trang. The Hoi An Ancient Town entrance fee, Hue Imperial Citadel, Perfume River cruise, royal tomb and Thien Mu Pagoda. Hanoi Old Quarter tour, Temple of Literature, One Pillar Pagoda and Ho Chi Minh stilt house. Halong Bay overnight cruise and water puppet performance in Hanoi. Please note that the minimum age for this group tour is 15 years of age.